Do you guys know Heather of Bits n Books? She's always reading books that are totally off my radar, and her excitement for the ones she loves shines brilliantly through her reviews and gets my TBR pile growing every time. Plus, she's from Australia, and now I can say that I have a friend in Australia. All this is to say: check her blog out! 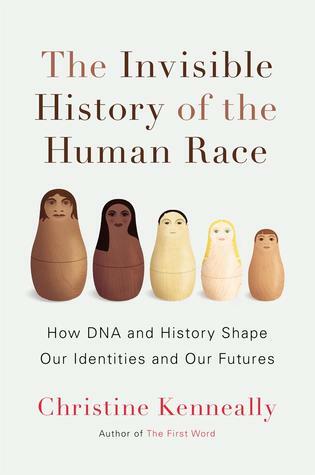 Early last month, Heather posted a review of The Invisible History of the Human Race: How DNA and History Shape Our Identities and Our Futures, written by Australian journalist Christine Kenneally. I loved reading about Heather's experience learning about her genetics through The Genographic Project and how Kenneally's book shed light on some of her results. Though Heather says she doesn't "really do science," I definitely do (if you haven't already picked up on that), and this book sounded like just the blend of hard and social science that I've come to love. Genetics has fascinated me since I took a course on it during my senior year of college, and I was excited by how many of Kenneally's factoids I remembered learning in class. I'll never forget good ol' Gregor and his pea plants. However, I think I learned far more about history than I did about DNA. This isn't necessarily a bad thing, but it's worth knowing for those who go into it expecting mostly scientific discussion. In addition to discussing what humans biologically pass down through their genes, Kenneally dives deep into the waters of cultural transmission, zeroing in on how communities form and maintain beliefs and attitudes over time. At one point, she discusses an economics study that examined how shifting agricultural practices (specifically, communities' adoption of the plow) affected beliefs about gender roles. When it was first debuted, the plow required significant upper-body strength to operate and, thus, was mostly used by men; because women weren't needed (or able) to help farm, they increasingly moved into the home. The researchers found that regions that adopted the plow were far more likely to develop more "traditional" ideas of women's roles over time. Not only that, but these kinds of beliefs are still found more strongly in these communities today than in communities that never adopted more mechanized (as opposed to manual) methods of farming. Kenneally is careful to note that correlation is not causation, but I have no trouble believing that our attitudes about "innate" characteristics of men and women were formed in response to changes in our environment, rather than vice versa. The book is chock full of fascinating citations like this; my only complaint is that the endnotes weren't longer! I wanted to research a few of her points further but found it difficult to work Google magic without some source hints. Thankfully, this didn't happen much. A few of the chapters were a slog, and I definitely found myself losing steam at the end as I ran up against my library due date. This book requires a lot of focus if you want to retain all the little details, so make sure to read it when you can give it your full attention (i.e., not during lunch break or while your boyfriend plays noisy video games right next to you). Oh, and thank you once again to Heather—I never would have stumbled upon this gem if not for you! Have you read The Invisible History of the Human Race? (Related: Is your name Heather?) Talk to me! This sounds so interesting! I don't read many science books, but I'd like to change that. I just got my DNA history tested this year, and it was so fascinating to see the results. I want to learn more! Thanks for this great review - I will definitely keep an eye out for this one. A combination of science and history is something that I love, and wish I would read more of (so many books, so little time), so thanks for letting me know about this one! On the list it goes. I'm with Naomi in loving history/science combos. I'm very much a history person (obvs) and can be picky about science, but love biological sciences, so this sounds like it could be a win for me. Naaaaw. Thanks for the shout out :-) I'm glad you enjoyed - and I completely agree about needing to devote your full attention to it. I have post-it flags hanging out of it all over the place so I can go back and look into things. There are lots of things that piqued my interest, but I can't remember half of them as my mum has my copy of the book at the moment with all the little post-it flags (which are probably really annoying her. But, I do remember being especially interested in the early eugenics. The extent of my knowledge of it is probably similar to what many others would be, namely the relationship between it and the Nazis during WW2. I'd not thought too much about the origins of it and it's something I definitely want to explore further. But! The huge thing for me was the economic impacts of slavery. There are obviously a myriad other problems stemming from slavery, but I was amazed to see that the poorest African countries today were the ones most heavily impacted by slavery. But it was such an obvious thing that I was surprised that I'd never really thought about it before. And I'm dying to get mine analyzed after reading this! Give me all the hard/social science-history combos you've got! Right?? It was just so info-dense! I know I probably missed a ton while I was reading. The economic impacts of slavery were another fascinating point she brought up, I agree! I definitely want to do more research into that, especially since I'm hoping to make a career out of the social and cultural determinants of health and life. The quotation you posted at the end is a great example of that.